If you’ve ever been stranded on the side of the road with a flat battery, you’ll already know what jump starters are as you probably looked into them. For anyone unfamiliar, let us introduce you to the jump starter. The concept is rather simple really. It’s like a normal car battery, except it’s portable, so you can carry it around everywhere. You won’t use it 99 percent of the time, but it will come more than handy when you actually do need to use it. As most flat batteries happen when you least expect them, for instance, a road trip or when in a rush, the only other alternative to the jump start battery are jumper cables. The problem with jumper cables is that you’re left at the mercy of a kind fellow motorist to lend you their battery so you can jump start your car. That’s not always possible, nor is it fast. Jump starters are relatively small and they don’t occupy a lot of space, so you can carry them around with you all the time. What’s more, most of them have lots of other practical and functional uses and features, but choosing the right one can be overwhelming if you’re not too familiar with the subject. To help you choose the right one, we’ve put together this buying guide. Most cars have a 12-volt battery, but older, classic vehicles use a 6-volt battery, and so do certain tractors. Check your battery’s voltage and buy a matching jump starter battery. As far as power goes, the more the better. The battery needs to have sufficient peak amps, as well as cranking amps to start your car. Most cars require modest power to start, but vehicles equipped with bigger factory batteries such as luxury limos and off-roaders might need a more powerful jump starter. Try to go for a jump starter with 900 Peak Amps or even more, and 225 or more cranking amps. Again, make sure to pay attention to your own car battery and match the cranking amps. Although you use it to jump start your car, the jump starter needs to be recharged as well. Obviously, it will keep its charge much better than your phone for instance, but it does have its limits. Things like colder temperatures affect how well the battery holds its charge as well. Most jump starters have an AC cord for charging, but consult your jump starter manual to ensure you always keep it fully charged. The last thing you want is a flat car battery AND a flat jump starter. Jump starters are usually safe, and wouldn’t kill you even if you were to really mess things up, but for your sake, choose one which has heavy duty insulated clamps. 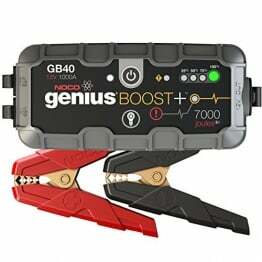 Often, you’ll be jump starting the car in less than ideal conditions (rain, dirt, dust inside the engine bay), and a well-insulated clamp protects you from unwanted shocks. It’s not something a lot of people think about, but it definitely makes sense. The cable length is not an issue in most cases, especially when your car battery is located right at the front of the engine bay, but for added flexibility as well as safety, try to find one with a three-foot cable at the minimum. You also won’t get dirty by resting on the car, as you won’t have to stretch as much to adjust and set up everything. Weight isn’t as important as the above features, but it does make a difference in certain cases. If you’re not using the jump starter often, choose a lighter unit with fewer accessories. Of course, that way you won’t have them should you need them, but as with everything, you have to compromise here too. Not a lot of people know this, but most jump starters have a power outlet for added convenience. As it’s a portable device with the capability of easy recharging, a jump starter is an excellent travel companion. You can use it to temporarily power all of your electronic devices. Video players, laptops, mobile phones, MP3 players… you name it. If you’re planning on using it as a power source, get one with both an AC and a DC outlet, so you cover the lot. Most modern vehicles don’t have lights under the hood. As nearly 50% of breakdowns happen during night time, it’s not a bad idea to consider a jump starter with a built-in light. This eliminates the necessity to carry a traditional light, saving you space, in addition to being all-round more versatile. High-end, more expensive jump starters have a built-in air compressor, which although not a necessary feature, might save you frustration as well as money. If you happen to have a flat, and the spare isn’t there (or it’s flat too), the air compressor can inflate your tire with relative ease. When the leak is too big, an air compressor might not make a big difference, but in most cases you can inflate the tire and limp to the nearest shop or even home. The last feature is more of a luxury, but it can come in handy none the less. You won’t find it on a lot of jump starters, but those equipped with a built-in radio do offer one extra feature. If we’re completely honest, you’ll hardly ever use the radio, if at all, simply because you only break out the jump starter for a quick bump start, but it has its uses. If you’re stuck with a mechanical problem on the side of the road, or an issue not related to the battery, you can use the radio to pass the time as well as keep track of events. We hope this article helped you decide on a jump starter perfect for your needs. Keep this space on your radar as the next article will teach you how to properly use a jump starter.